In case you haven’t heard about it already, Kentucky Fried Chicken has introduced the Double Down. This sandwich consists of of two breaded, fried chicken breasts masquerading as the bun, with bacon, processed pepper jack cheese and the “Colonel’s Sauce” in between. If you want more on the nutritional catastrophe that this bunless wonder is you can read about it here and here. These articles also include the pretty, food-styled look that KFC is trying to sell. My picture is the actual look, albeit taken with a cell phone. So, yes, I took the plunge and ate a Double Down. Let me qualify this by saying, I didn’t pay for it, nor did I seek it out. I did not enter a KFC restaurant. But when the opportunity to try one arose, being an “I’lll try anything” kind of girl, I decided to go for it. So you’re saying, “How was it already? !” In a word, salty. Really that was my first and most persistent feeling about it. It also makes sense given you’re getting about a day’s worth of sodium from the thing with no bread to counteract it. Other than that, it was unimpressive. I didn’t feel overwhelmingly ill after eating it, mostly just sluggish. If it had been combined with fries though, it might have been the end of me. Also, I don’t know if it’s because it wasn’t super-fresh, but more crispiness in the bacon might have improved it for me, maybe. 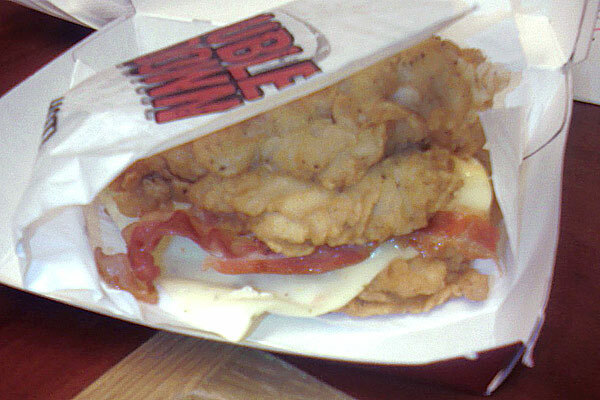 So as much as KFC chicken is a once-every-couple-of-years guilty pleasure, I can’t say the Double Down will be on my order. We like to eat KFC once every couple of years as well. We had it this past summer and that will be enough for quite some time. I can’t believe you ate the whole thing …. (remember that retro alka-saltzer commercial from the 70’s) Seriously, it’s no wonder people are getting high blood pressure from all that salt. Ew I promise never to try it… ever. I saw them eating it on Canada AM and they all looked like they wanted to vomit. IMMEDIATELY. Wow – gotta love a ‘try anything gal’ – me too! But this is daunting! I think I’ll show your pic to my loves-KFC fiance as a cautionary tale! Gotta say, every since they took away the crispy style – KFC does’t do it for me (which is a very, very good thing)! There are many more things that are just awful for you but oh, so good – like legitimately excellent but heart-horrible buffalo wings! Thanks for takin’ one for the team, Amanda! At first I thought this was a joke. OMG! 53% FAT ! I think my no-carb eating friends may find this appealing, however, the thought of it just turns my stomach. KFC is not the best heart-healthy-conscious food choice to begin with, but add bacon, cheese, and (most likely) high fat sauce to the mix and this gives “heart attack on a plate” a new meaning. Wow. I tried it. I won’t make it a regular part of my diet, but I can see myself getting a craving for one every now and then. I bet they become very popular among hungover students!